I remember it was July 4th, U.S. Independence day that hubby and I decided that we should try out this place call India Palace at Burnsville, Minnesota. They have several different location and apparently this place has very good review. When we were dining there, we noticed that many South Asians (I don’t want to just assume they were Indian, because they could be Bangladeshi, Pakistani or Srilankan. You get my point!) ate there too. Which is a good sign. We were having buffet and it’s been more than a year since I have Indian food. Definitely a place we will go back to. 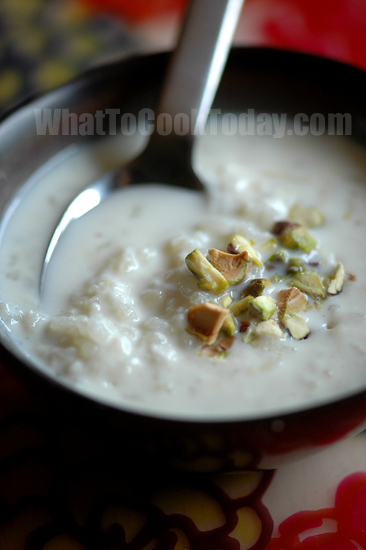 The rice pudding is so simple to make. 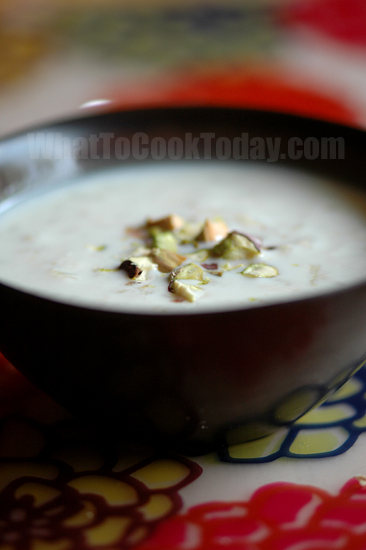 It basically consists of milk, basmati rice, cardamon pods and sugar, but don’t let simplicity fools you because it is very delicious and aromatic. You can eat it warm or chilled. I like mine chilled 🙂 Try it and I believe you will love it.